How Long Does a Sleep Study Last? | Advanced Sleep Medicine Services, Inc.
Sleep studies are performed to rule out or diagnose sleep disorders such as sleep apnea and narcolepsy. A sleep study can take place in a sleep center or in a patient’s home (learn about the difference between in-center and in-home testing here). If you have just scheduled or are planning to schedule your first sleep study, you may wonder how long the entire procedure will take. In this post, we’ll cover the typical length of different types of sleep studies. When we talk about sleep studies, we’re usually referring to polysomnography or PSG. PSG monitors many body functions including brain (EEG), eye movements (EOG), muscle activity or skeletal muscle activation (EMG), heart rhythm (ECG), respiratory airflow and respiratory effort and peripheral pulse oximetry during sleep (learn more about how pulse oximetry is recorded here). At Advanced Sleep Medicine Services, we use the term PSG to denote a sleep study that is diagnostic only (does not include the use of CPAP) and is performed in the sleep center (read more about the different types of sleep studies here). What is a titration study, 50/50 or split night study? A titration study is a type of polysomnography that is performed when a patient has been previously diagnosed with sleep apnea (either with an in-center or in-home sleep study) and is used to determine the optimal CPAP settings which eliminate all or most apnea events. Split night polysomnography, also known as a 50/50 study, is an in-center test that begins with diagnostic polysomnography and switches to PAP therapy titration once the patient shows sufficient apnea events. This test is often ordered when sleep apnea is highly likely and can eliminate the need for a second night sleep study if the titration is successfully completed. Most sleep studies start in the evening. Most of our appointments start between 9pm and 10:30pm. There may be multiple patients scheduled per each technician at the sleep center. The technician will spend around 45 minutes with each patient completing the hook-up where electrodes are placed on the patient’s head, face and body. Depending on the number of patients and the start time of the appointment, most PSGs will end at about 5:30am to 6:00am the following morning. 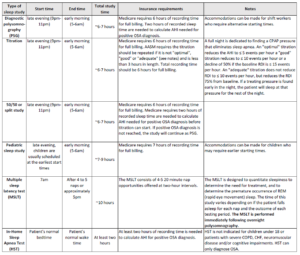 For a comprehensive explanation of the different types of sleep studies, the sleep disorders they are used to diagnose or rule out, and their CPT codes, check out our sleep study guide here. For a complete sleep-related ICD9 and ICD10 guide, click here. To learn more about MSLTs and narcolepsy, check out our resources here. Learn more about sleep studies for children here. Do you need to schedule an appointment for a sleep study? If so, contact us today! Can I Take a Sleeping Aid (Sleeping Pill) Before my Sleep Study? Can I Drink a Glass of Wine (or Beer) Before My Sleep Study? Can I Smoke During My Sleep Study?